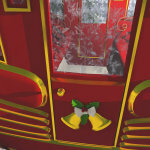 Christmas Stage Coach for Poser/DS, 3DS MAX, Blender, Vue, Shade and Bryce is model 3 of 8 of Christmas Village 2014 (or just “14”). 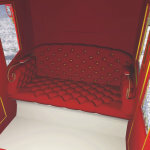 Now on Mirye Software, Meshbox Design, and Content Paradise. 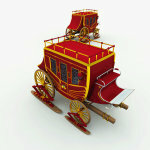 This gold and red stage coach has a rich interior, with a large rack for holding parcels above. 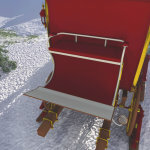 Because the terrain can be rough going, there are detachable snow runners that attach right to the wheels. 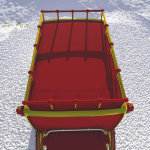 A harness system is also included and fully removable. The Poser / DS version of the harness system includes poses for Toon Reindeer, allowing Toon Reindeer to be posed for all eight positions! Toon Reindeer is not included, but you can also get it here.